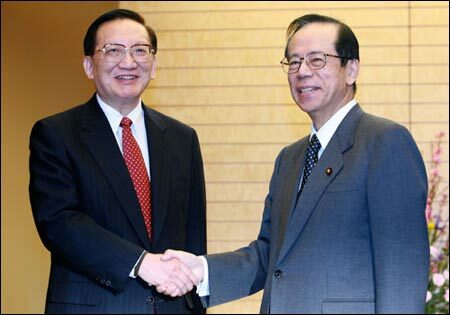 Japanese Prime Minister Yasuo Fukuda (R) shakes hands with visiting Chinese State Councilor Tang Jiaxuan during their meeting in <?xml:namespace prefix = st1 ns = "urn:schemas-microsoft-com:office:smarttags" />Tokyo, Japan, on February 21, 2008. Tang Jiaxuan arrived in Tokyo late Wednesday for a four-day visit at the invitation of the Japanese government. Tang recalled the wide range of agreements reached between Chinese leaders and Fukuda regarding the development of Sino-Japanese mutual beneficial ties based on common strategic interests during his visit to China at the end of last year. Tang said China is willing to work with Japan to carefully implement the agreements reached, and to strengthen exchanges, promote mutual trust, expand cooperation, and properly deal with sensitive issues to push the Sino-Japanese relationship onto a new stage. Tang said the Sino-Japanese relationship is standing at a new historic threshold and is facing new opportunities. President Hu's upcoming state visit to Japan scheduled for spring bears great and far-reaching significance in pushing forward the continuous development of the Sino-Japanese ties, Tang said. Year 2008 will inject new vigor into the bilateral relationship as it is the Sino-Japanese Youths Friendly Exchange Year and the Beijing Olympics year, the state councilor said. Fukuda in his part said the Japanese government and the Japanese people are expecting and will warmly welcome President Hu's Japan visit, and would like to make joint efforts with the Chinese side to ensure the success of the visit and to add new power to the development of the Japan-China relations. Fukuda and Tang also agreed to strengthen cooperation on food safety and jointly preserve the general improvement and development of the Sino-Japanese ties.